Dr Jeff Masters shows why siting (and instrumentation) matters – Death Valley steals all time temperature record from Libya | Watts Up With That? I had to chuckle when I read this. Dr. Jeff Masters writes about the newly discovered siting and instrumentation issues that takes away the all time temperature record from Libya. Let’s hope it doesn’t cause any riots. As any weather aficionado can avow, Earth’s most iconic weather record has long been the legendary all-time hottest temperature of 58°C (136.4°F) measured 90 years ago today at El Azizia, Libya on September 13, 1922. One hundred thirty six degrees! It’s difficult to comprehend that heat like that could exist on our planet. For 90 years, no place on Earth has come close to beating the unbelievable 136 degree reading from Al Azizia, and for good reason–the record is simply not believable. But Earth’s mightiest weather record has been officially cast down. Christopher C. Burt, Weather Underground’s historian, tells more of the story of how he reopened the issue. Nevertheless, the investigation was approved and on February 8, 2011 an international team of climate experts was assembled (eventually 13 atmospheric scientists in all) by Randy. The official investigation began. Amazingly, El Fadli had just uncovered a key document: the actual log sheet of the observations made at Azizia in September 1922 (see illustration further below). 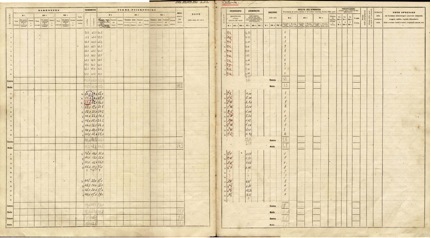 The log sheet clearly illustrated that a change of observers had occurred (as was evidenced by the hand written script) on September 11, 1922, just two days prior to the ostensible record temperature of 58° on September 13th. Furthermore, the new observer had interchanged the Tmin columns with the Tmax columns. Also, Philip Eden of the Royal Meteorological Society and others uncovered information concerning the unreliability of the Bellani-Six type of thermometer that had apparently been used at Azizia in September 1922. Of particular interest was how the slide within the thermometer casing was of a length equivalent to 7°C. It would be easy for an inexperienced observer to mistakenly read the top of the slide for the daily maximum temperature rather than correctly reading the bottom of such slide, a point that El Fadli made in a message to me early on in the investigation. A 1933 instrument catalog image of the Bellani-Six style thermometer. Image supplied by Paolo Brenni, President of the Scientific Instrument Commission, and courtesy of Library of the Observatorio Astronomico Di Palermo, Gisuseppe S. Vaiana. So a combination of siting, inexperience, and instrumentation led to a record that was 7 degrees high, and it has taken decades to figure this out. It makes you wonder just how many other weather records and data are erroneous. My congratulations to Weather Underground for making this find. In climatology, record-breaking is of little significance climatically speaking. An all-time hot record in one place can be easily matched by an all-time cold record somewhere else. This year in the U.S. and in Australia, both hot and cold records have been broken at various times and places. They make interesting fare for the Guinness Book of Records, but little else. However, record-breaking does have one purpose for the greenhouse industry, namely that of heightening public fears about global warming. For this reason, the industry likes to see hot records being broken as often as possible, present a lot of media hype about them, and then go into quick denial and spin-making when cold records are broken, sometimes even blaming the cold record on global warming! The industry also dislikes a hot record being very old, such as the all-time hot daytime record for Australia of 53.1°C. set at Cloncurry, Queensland in 1889. Valuable research money and academic effort was spent in a futile effort to discredit that one record (Trewin, B., Aust. Met. Mag. 46 (1997) 251-256). There is one all-time hot record that is the ultimate global prize: 58°C (136°F) set at Al Aziziya, Libya, in 1922. This was the hottest temperature ever recorded anywhere in the world and has stood for 80 years in spite of real or imagined `global warming”. It is even noted in the Guinness Book of Records. But 1922 is a long time ago and the longer it stands, the less convincing are the claims about global warming in the eyes of the public. To topple this record, the industry has not bothered with the Cloncurry approach – that of seeking to discredit the record itself – as that appeared to be, and was, merely sour grapes and spin. Instead, the NASA Ames Research Center (ARC), has set up their own temperature instrument in Death Valley, even though there is already a long-standing instrument at Furnace Creek right in the open central part of the valley. 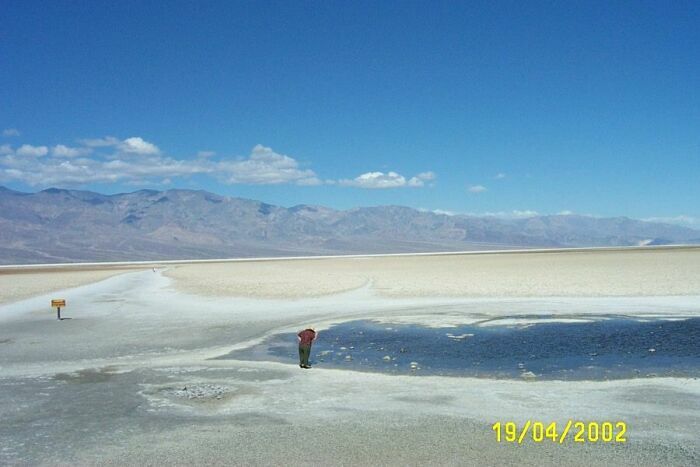 The new instrument is located 20 miles south of Furnace Creek at Badwater (Fig.1). 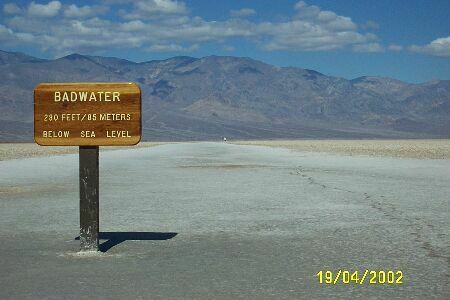 The photo shows the Badwater area with a large salt pan stretching into the far distance, caused by evaporation of salty water welling up from a spring just metres this side of the sign shown in the photo. It was at Furnace Creek that the all-time hottest record in the USA was broken, 57°C. ( 134°F.) in 1913, just 2°F short of the Libyan all-time record. The GISS historical data for Death Valley (i.e. Furnace Creek) is presented left and shows no overall warming at Death Valley since the 1950s. The new instrument at Badwater was installed in the late 1990s, but it must be stressed that the record left is for Furnace Creek, not Badwater. Yet the public plaque on the instrument at Badwater implies otherwise. Having mentioned 1998, that year was conveniently left off the chart. And with good reason, as Fig.2 shows that 1998 was a particularly cool year. (left) Fig.4 – The Badwater instrument. What exactly do those skilfully crafted words on the plaque mean anyway? Note, it refers to 1998 as the `warmest year on record’, but omits to say they are referring to the world as whole, not to Death Valley itself. 1998 at Death Valley (Furnace Creek) was actually cooler than usual. 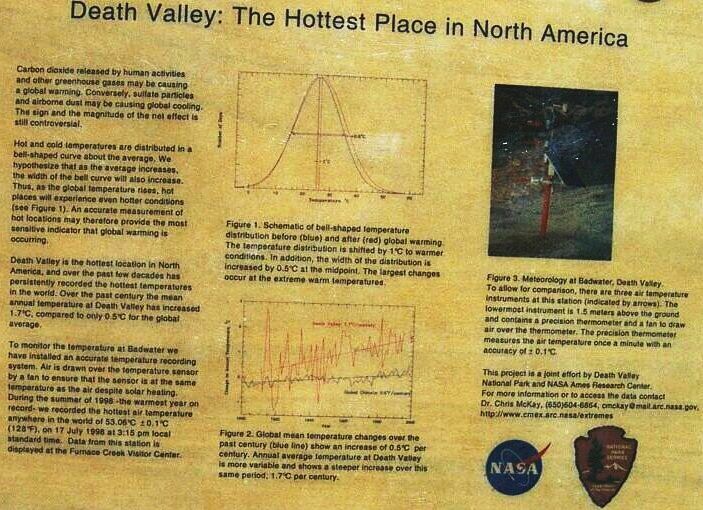 The plaque claims Death Valley recorded the hottest air temperature anywhere in the world on 17th July 1998 – implying it was an all-time world record. It was not. It was referring to 1998 only. Actually, the hottest temperature ever recorded at Death Valley was way back in 1913 on 10th July – a whopping 134°F (57°C). The sharp dip in temperature near the end of the record (Fig.2) was – 1998 ! – the `warmest year on record’ according to the plaque. In fact, 1998 was the coolest year at Death Valley since 1945, belying the implied claims about 1998. Note how the ARC plaque refers to `Death Valley’ generally and not Badwater or Furnace Creek specifically. This merging of two quite different locations 20 miles apart is itself misleading to the public who may be unaware that `Death Valley’ now has more than one weather station. A photo of the weather instrument at Badwater is shown left, the small yellow plaque mounted low down on the structure. I visited there during my trip in April this year. Unlike the Furnace Creek instrument which is located in the open centre of the big valley, the new instrument has been mounted next to the eastern side of the valley at Badwater. The local topography is such that the instrument sits in a curved hollow (topographical map – Fig.5) so that it is well sheltered from all but westerly winds, and fully exposed to the afternoon summer sun. 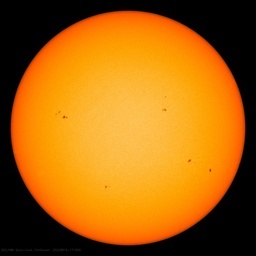 In fact, the whole area around the instrument is a perfect afternoon sun trap. On the east side of the instrument is a high west-facing cliff over 500 feet tall, a cliff which will heat up magnificently in the afternoon sun on a hot summer’s day. 280 feet up on that cliff is a large sign which says `mean sea level’ (Badwater is 285 feet below sea level). Rising steeply above the cliff is the aptly named Dantes Peak, 785 feet high, overlooking what must be the nearest thing to `Dante’s Hell’ on Earth – Badwater in Death Valley. On the western side of the instrument is a vast white salt pan, caused by salt deposits from a spring bubbling up from underground (the `bad water’) (Fig.1&6). This salt pan has a high albedo to sunlight so that the afternoon sun will reflect light and heat off the white expanse directly onto the cliff and the instrument itself. On a bright afternoon, it will act almost like a mirror to sunlight. In all of Death Valley, the ARC has chosen just about the hottest spot possible in the hottest valley in North America. They have in effect put it into a natural oven – and done so in the full knowledge of Badwater’s topography. Now all they have to do is wait – wait for the inevitable day when the conditions will be just right – clear skies, still air, a blazing sun, and that instrument will heat up from the combined heating of the air, the immense heating from the nearby cliff only metres behind the instrument, the intense reflected heat radiation from the salt pan, and the mercury will very likely fall over the Libyan line and record the `hottest temperature ever measured on earth’. Then we will see the champagne corks fly as the greenhouse industry will cry with righteous indignation, announcing the `new hottest temperature ever recorded on earth’, how it’s all due to global warming etc. etc. and all the time, the whole thing will be about as fake as a three dollar bill. Even the wording on the plaque on the instrument betrays the real intent – the exclusive emphasis on the significance of heat, of global warming, of record-breaking temperatures, of the `hottest year ever’ etc. The plaque speaks of little else. Even the opening words of the text are `Carbon dioxide released by human activities etc. ….’. Consequently, it is reasonable to conclude that record-breaking is the primary purpose of the instrument, not genuine climatic research. Even here, we have the focus squarely on global warming and breaking records just as on the plaque. ARC even reports the breaking of a continental record. If the Libyan world record of 1922 is broken, as seems inevitable at Badwater eventually, we can expect the full media scare treatment. Death Valley is an interesting natural phenomenon because this valley is so unique, but the only instrument which will be credible in setting records or trends is the one at Furnace Creek, set properly in the open middle of the valley with a long respectable history of temperature data behind it. If there is a media announcement of a record being broken at Death Valley, the skeptical observer should immediately demand to know if the record was broken at Furnace Creek, or at Badwater. If it is Furnace Creek, then the record will be quite genuine. But if it is Badwater, then the record will be a complete fake. TEMPE, Ariz. – If you think this summer was hot, it’s nothing compared to the summer of 1913, when the hottest temperature ever recorded was a searing 134 F in Death Valley, Calif. But while that reading was made 99 years ago, it is only being recognized today by the World Meteorological Organization (WMO) as the most extreme temperature ever recorded. That’s because an international team of meteorologists recently finished an in-depth investigation of what had been the world-record temperature extreme of 58 C (136.4 F), recorded on Sept. 13, 1922 in El Azizia, Libya. The group found that there were enough questions surrounding the measurement and how it was made that it was probably inaccurate, overturning the record 90 years to the day it was recorded. “We found systematic errors in the 1922 reading,” said Randy Cerveny, an Arizona State University President’s Professor in the School of Geographical Sciences and Urban Planning. “This change to the record books required significant sleuthing and a lot of forensic records work,” added Cerveny, who also is the Rapporteur of Climate and Weather Extremes for the WMO, the person responsible for keeping worldwide weather records. Officially, the “new” world record temperature extreme is 56.7 C (134 F), recorded on July 10, 1913, at Greenland Ranch in Death Valley, Calif., USA. “In the heart of every meteorologist and climatologist beats the soul of a detective,” said Cerveny. In this case the weather detectives had to work around an unfolding revolution in Libya. Cerveny said the El Azizia temperature had long been thought as dubious. It was recorded in 1922 at what then was an Italian army base. The international meteorological team – which included experts from Libya, Italy, Spain, Egypt, France, Morocco, Argentina, U.S. and the UK – identified five major concerns with the El Azizia temperature record. They included the use of antiquated instrumentation, a likely inexperienced observer, an observation site which was not representative of the desert surroundings, poor matching of the extreme to other nearby locations and poor matching to subsequent temperatures recorded at the site. The WMO evaluation committee concluded the most compelling scenario for the 1922 event was that a new and inexperienced observer, not trained in the use of an unsuitable replacement instrument that could be easily misread, improperly recorded the observation. The reading was consequently in error by about seven degrees Celsius (12.6 F). The detective work Cerveny describes included finding and examining the original log sheet, which he said was very useful. In reconstructing the events, Cerveny describes a person new to making temperature measurements being asked to make the measurements with a “Six-Bellini thermometer,” which even by 1922 standards was an obsolete piece of technology. By reviewing the logs, it became apparent that the person who recorded the temperature was transposing what he read from the thermometer, consistently scoring the readings in the wrong column of the log. Other telling forensic information included the general location of where the measurement was made – El Azizia is roughly 35 miles southwest of Tripoli, which is on the Mediterranean coast – and the fact that the record temperature pretty much stood out among all of the other recorded values near the El Azizia location. “When we compared his observations to surrounding areas and to other measurements made before and after the 1922 reading, they simply didn’t match up,” Cerveny said. The investigation was launched in 2010 and soon after the revolution in Libyan started to form. The Libyan official on the team (Khalid El Fadli, director of the climate section of the Libyan National Meteorological Center) fell out of contact with the rest of the team for about eight months and the investigation went into a suspended state. Then El Fadli sent word that he was safe (although he and his family left Tripoli for a while to avoid being accidently shot in the turmoil) and he could resume his role in the investigation. But another three weeks passed before El Fadli was heard from again. Fortunately, after the revolution, El Fadli could resume his duties as a lead meteorologist with the new government and the investigation started up again. Beyond establishing bragging rights, Cerveny said the world record highest temperature does have some important uses. “This is the highest recorded temperature of where people live, so this type of data can help cities that exist in such environments to design buildings that are best suited for these extremes,” he said. “Knowing the maximum temperatures certain materials must endure leads to better products and designs. That’s why many auto manufactures have test tracks in the hot Mohave desert. Cerveny added that there also are important basic science implications in this finding. A full list of weather and climate extremes is available at the WMO Archive of Weather and Climate Extremes (http://wmo.asu.edu/). This includes the world’s highest and lowest temperatures, rainfall, heaviest hailstone, longest dry period, maximum gust of wind, as well as hemispheric weather and climate extremes. If global warming is a substantial, real phenomenon, why do its proponents feel obliged to lie, and lie, and lie again, in defence of it? I suspect that things are milder than they were 100 years ago but the more the Global Warmmongers lie, the more I have to wonder. A record’s a record, let them have it. It will only make them look foolish if they get a perfect day and then have to wait another 90 years to do it again. Sorry but the Death Valley measurements are invalid as there is no grass there! Well, I can get a “record”, greater than 134F in my kitchen — easy as pie. Literally. These are the folks we’re not supposed to say Boo to! Sorry. I won’t believe it no matter where they say it is. Warmists lie. I can’t think of a charitable explanation for the installation of the new weather station. It appears the motive is deception and manipulation. Thanks for pointing out this example of tax dollars used against taxpayers. What is not included here is a direct comparison between readings at Furnace Creek and Badwater. How do they compare? I do believe the Badwater instrument is specifically placed to maximize temperature. I’ve been there. There isn’t anything wrong with siting an instrument specifically to record the highest temperature ever as long as the actual measurements there are accurate. For comparison and “hottest ever” record keeping purposes it seems a calibration between the two Death Valley instruments could be established for that purpose. Unless my eyes were deceiving me this summer in Demir Dagh, Iraq, I saw the ‘mercury’ go past 57C in the shade on a rig site. This was on the shady side of a rig building on a gravel location. Standing in the sun, the temperature was 64C. Brutally hot. You don’t know that you are sweating about one litre of water in twenty minutes, because it evaporates as fast as it secretes. Dangerous dehydration occurs so rapidly that you feel like a prune in short order, you urine turns brown. To be sure, this is not an ideal ‘site’, but the adjacent countryside is dry, beige, and just as hot. Warmists continue to throw out temperatures they do not like, and keep that which supports their hypothesis even if the same should be discarded for the same error. And rather than correct instrument siting, Warmists appear to be embracing poor siting to further the cause. Fascinating stuff. But what about the minimum temperatures? Surely if the world as a whole was warming the minimum temperatures would also be rising? Great work researching the record! well done article. The global warming hyperbole is like a playing a board game with a six year old who makes up rules and cannot handle the real world. On a side note, I thought the riot joke was fine. People should stop tying themselves into pretzels to appease unbalanced people. Does not the photoelectric plate hold heat an act as a heat radiator later? This is the US equivalent of the Gravesend, UK station siting, highlighted over at the Talkshop a few weeks ago and given space here at WUWT. I can hardly believe how similar the trains of thought are, right down to the fact that Badwater was shoved in that little suntrap only 4 years after Gravesend was set up in a sheltered hollow and yards from a 25kw output air conditioning outlet. When the inevitable happened in summer 2003 it really focussed minds on global warming because it wasn’t just a record but had crossed the 100F threshold for the first time anywhere in the UK. Perfect propaganda for a media fest. I would suggest tagging this post with a multitude of key words and phrases (like “world record temperature death valley”) that will catch future searches when the record is eventually broken. After all, these people will be looking for the detailed truth behind the story, and they’ll get it. They’ll just be a bit surprised at what it looks like. The word fakirs comes to mind. I suggest going one step further and printing out this article and discreetly burying it with some sort of time stamp in a strong box just a few meters away from the temperature sensor. That sort of over-the-top thing would show not only that the behavior seen by the CAGWers here is absurd and entirely predictable (as your post would do), but it could also catch a bunch of headlines. While I’m joking somewhat, part of me is being serious. This kind of obvious maneuver seems short-sighted since it calls into question the entire historical record that we are supposed to believe. Can we call for a team of international experts to examine every piece of data for the last century and a half? They underestimate the public. By the way, Libya was an Italian colony at the time and Mussolini was on his way to power, so while they’re at it, will they please tell us where they got their World War II Axis data? Great discussion and I liked the comment about Libyans behaving badly! I’m wondering, if one was trying to set a temperature record, if there are any other places in Death Valley that would work better than Badwater to do it. If there are other places that would accentuate the heat more, then that weakens the case for them putting it there just for a record. If Badwater IS the best location for a record, that strengthens the argument that the site was picked for the purpose of breaking a record and to further a specific agenda. Another thing to look at is whether the location is a focal point of the “mirror effect”. The location does look suspect, but I hate to attribute to evil that which can be adequately explained by stupidity. So, in the interest of actual science, I’ll put forward an hypothesis that if/when the Badwater location sets a record, they’ll make a big deal of it and conveniently forget to mention the traditional location. Also, if they start making a deal about warmer temperatures in general, I’d predict those temperatures to be from Badwater as well. The value of any theory is its predictive ability, so we wait and see. With this post anyone who tries to use a record from Badwater has been warned of the siting problem and will hurt their reputation trying to draw conclusions from it. As for the riot joke, I would say is half humor, half serious. The wackos in the middle east are pretty easy to set off. I think their motto is “if you need an excuse, any will do”. Censoring humor simply gives the bad guys respect and standing they don’t deserve. That is what I was thinking too. Who the hell design those stations? I am pretty sure those photo voltaic cells act as a black body. The must be so hot that you can’t put your hand on them without getting a serious burn. Moreover, they are sitting right under the thermometers and there is even a smaller cell sitting on top helping to direct the heat to the thermometers. I am certain this station was designed and placed at this spot to intentionally break a max temp record… certain not to measure a “representative” temperature of Death Valley. I agree; the panel is way too close to the temperature sensor and the panel is designed to absorb sunlight. They heat up very rapidly and to temperatures way above ambient. The temperature sensor also appears to be sited immediately above an electronics box (obviously contains a battery + charging electronics) which is undoubtedly another heat dissipator. It will be fairly easy to demolish any ‘record’ unless something is done about the siting of the sensor relative to its electrical supply and control. No wonder they think Greenland is melting… But don’t let Hansen see this or he’ll have to adjust the temperatures for 1913 downward. You just can’t let record highs from a hundred years ago defy the narrative that we are currently in the midst of rapidly accelerating global warming. It must be pretty hot at Lewandovsky’s office right now – a world record surely? Thanks, I learned something new. I have a six style thermometer attached to my house. I did not even realize it. It is very old with a slight coat of rust. It does an excellent job with temperature. I always wondered what the blue marks were for. I just reset them for the first time in at least 18 years. They were at 5 and 97. If I had to guess, it is from the 50’s or earlier. It won’t matter to the trend signature where this instrument is placed, but for bragging rights they can’t have sited it better. It is quite a simple question, when and why has the old Stevenson screen been replaced with this new style of electronic sensors? I can understand the new sensors, but not the lack of the stevenson screen box. My logic says that a larger box will suffer less fluctuation in temps (especially in ‘still’ air) due to the still air ‘inside’ the screen taking time to equilibriate with the outside air. If you also consider that hotter temps will likely be on still days, this would suggest the newer style will record hotter temps – has anyone compared the two? Comments? Also, what is the standard height of temp sensor installation, which of the beehive sensors is it on the station and is this installation correct (or of good quality)? Well you need to keep in mind, that it is the middle of winter midnight at Vostok Station and all points higher, where the record low of -128 something happened, and both of these extremes can co-exist. Due to a clever argument by Galileo, we can also say that any continuous curved line between thise two points, has on it, a point, having any temperature within that extreme range. Since there are an infinite number of such lines, there are an infinite number of points that simultaneously have any Temperature between those extremes, which are basically from -90 C to maybe + 60 C if you consider the ground Temperature of that blacktop. That extreme 150 deg C total range, easily becomes a routine 120 deg C range; and some silly people think that a one deg F change over 150 years, is some kind of big deal. These “studies” that get posted to this website have a distinct whiff of the same type of substance that permeates “studies” debunking evolution. Creationists will never be satisfied with an imperfect fossil record and anomalies with some forms of radio-isotope dating and the AGW skeptics will never be satisfied with any temperature measurement anywhere. Well who in their right mind, would want solar cells that behave like black bodies. They are supposed to convert Radiant Energy to ELECTRICITY not HEAT.
. . . monitor global warming — which is much more noticeable in an extremely hot environment like Death Valley . . .
What circumstances would make it more noticeable in a hot location than a cold one? Off the cuff you would think that proportionately the tiny 0.10 – 0.3 C/decade trend would be more obvious closer to the poles than in Death Valley. WTF? So you are comparing creationists with AGW skeptics? Are you completely mad, Sir? If you cannot even comprehend the difference of your own free will and using the ‘grey’ matter within your skull, you are surely incapable of being taught or guided……. Typical of the nation’s “temperature record”. It took them ninety years to discover the error!. Yet another “discovery” for “scientists” to add to their quiver. Why don’t they just “adjust” the record as they go along? It would be more efficient. This whole “global warming” fiasco has set back public perception of “Science” by decades. Can anyone believe anything that comes from a government mouth anymore? In Real Estate, it’s “Location! Location! Location”. In Science, it’ “Agenda! Agenda! Agenda!”. So what you are saying is that the sensors in this valley mimic the solar collector death rays imagined in James Bond movies, right? Seems life is stranger than fiction. Perhaps more simply, do you think the conversion of radiant energy to electricity is 100% efficient, such that the tempeerature of the ‘black’ PV cells does not rise above ambient….No? I thought not…….which means the energy NOT captured/converted must go where, exactly?….. Please remove the unnecessary and unhumorous reference to rioting in Libya. It’s uncalled for here. Looking at the temperatures as recorded in DV in that 1913 week, the 134 degrees F is certainly an outlier, an anomaly compared with those before and after. The statistical variance is ‘way out of whack. There must be something wrong with it. It too must be debunked. Who will be the first to get it thrown out too? Let’s get started, people! It’s not a joke it’s irony. Irony doesn’t respect your overly sensitive sensibilities. The name Chis McKay, mentioned by Daly, sets off alarm bells with me. I ran into his BS with regard to the Huygens probe mission to Titan. How interesting that he is implicated as a global warming zealot, because with regard to Titan McKay has twisted reality to make Titan behave as if it was a member of the global warming club. He concocted the notion of an anti-greenhouse effect in order to explain away the anomalous cold. Make no mistake this newly manufactured concept of an anti-greenhouse was created specifically to cover up the fact that Titan doesn’t have a greenhouse effect. You can tell because what McKay describes as the causative agent of his anti-greenhouse, nitrogen haze functioning like a “nuclear winter” is precisely defined as albedo. Where does he get off redefining astronomical terms to suit his nefarious political agenda? You see because Titan has an atmosphere swamped by the greenhouse gas methane. It should be, not warm per say compared to Earth, but very warm compared to the surrounding area (Saturn and it’s various moons) due to the 5% methane constituent. Now check this out. In orbit right next to Titan there is another moon named Hyperion. It has no atmosphere what so ever. It’s surface is open to the cold of deep space. Make no mistake, Hyperion’s temperature is a direct function of it’s albedo, (0.3). TItan’s surface temperature is 93.7 Kelvin. (source Wikipedia) measured directly at the Huygens probe. Titan’s albedo is variable due to active weather systems, but still very close to the Hyperion (0.22 – 0.3) . Airless moon, same albedo, same temperature as the supposed greenhouse swamp moon with the thick greenhouse gas blanket. OK. So they showed that the thermometer COULD be misread. Did they prove that he ACTUALLY DID misread it? I have a similar thermometer from my grandparent’s porch. The marker is a completely different color than the mercury, so it’s quite easy to read it right. That is, IMO, a weak argument. As for the “asphalt”: NOW they care a thermometer is sited above an inapproporiote surface? NOW? They never did before. All the photos on surfacestations of thermometers on asphalt pads next to A/C units and burn bins they ignore, but THIS one from 1922 is a problem. It’s obvious that they are going to sytematically pick off and nullify all the old max-temp records until the 1998 reading from Death Valley is the last man standing. Then they can say “See! Heat is getting more extreme, just like we predicted!” Who’s running the show over there? Ayn Rand?? Thank the Gods that last post went through. I hesitate to make longish comments sometimes because of the hit and miss nature of the beast. And where does NASA get off assigning global warming zealots to pollute the exploration of the outer solar system? Being hot is part of the whole Death valley experience so I don’t blame them for looking to set records. The whole thing with the carefully chosen site and the plaque and all looks to me like the locals trying to create an attraction. If they could lay claim to the “hottest place on earth” a few more people might put Death Valley on their bucket list. I’d be interested to know whether NASA was approached by someone from the area – the park service perhaps – about putting a temperature station in that spot in the hope of capturing the record. I ask you to not do it, Anthony. Rioting radicals can never be allowed to silence free speech. Nor can overly sensitive commenters here. This is your blog, supplying them a platform for their own free speech, & they’re using it to tell you that you should not exercise yours. I’ll wager they’ve even left a comment or two here, that a warmest would find insensitive. This must not be tolerated. They can go elsewhere. If you choose to remain non-political here, so be it. Don’t allow them to choose for you. I used to work for local governments in various parts of Queensland, Australia. The local council clerk or post office clerk usually read the temperature record. The thermometers were only good for a guess at half a degree accuracy. How do they get the precision for modern records to hundredths of a degree from records like this ?? The whole thing is unscientific nonsense – what has happened to academia when they preach an unproven hypothesis as science that you daren’t question less you be insulted and villified ??? I wonder–would a thermometer placed on the shore of the Dead Sea in Israel be an even better candidate to break the world record? Badwater is 284 feet below sea level and a salt plain; the Dead Sea is 1282 feet below sea level and, I believe, has extensive salt deposits around its southern end. The first of the thermometers pictured has a maximum calibration of 50C, the second has a maximum of 130F. I assume slightly different models (oops, there’s that word) were used to obtain the 58C / 136.4F readings. I also was in Death valley in April of this year, less than a mile from the Badwater station, and when the wind picked up in the afternoon this Canadian prairie boy went running for his winter coat; it was COLD at Dante’s View. Location matters. Figure 3 appears to be wrong. Based on images on Google maps, the weather station is between the road and the cliff. (Figure 3 shows it on the other side of the road.) Since the cliff will tend to be much hotter than the air at the same elevation, I assume that convection will actually tend to cool the weather station. Based on the photos, the weather station is about 50 feet from the road. I like the way they placed the solar panels. they seem to know something about convection and hot surfaces. This configuration makes full use of the hot air streaming upward off the back and the front of the lower solar panel, and channels the hot air into the temperature sensors. However this is not the correct way to measure air temperature. The solar panels should be at the top of the mast, along with anything that produces hot air. Better yet would be that the solar panel and the electronics are placed way form the measuring instruments so as not to affect them. The Libyan rioting mention is very relevant. We worry about burn barrels and BBQ’s next to temperature measuring instruments. Why not worry about burning cars and buildings? In the interest of full disclosure, be it here known that “sailaway” is none other than george e. smith, who worked all day yesterday till 4 AM this morning after working from 8 AM to 2 AM the day before. Damned if I know what I was reading when I misspelled my own name. No conspiracy theory here; so move along now. “One hundred thirty six degrees! It’s difficult to comprehend that heat like that could exist on our planet”. In 2003 in Oman at a place called Yibal we were repairing an oilwell and I thought it was getting hot. It felt like the rig floor was going to melt. Even the heat tolerant Omani hands were tearing off clothes – normally they would keep a loose wrapping on to take advantage of sweat based evaporative cooling. They were wilting and said it was hot so I checked the shaded digital thermometer hanging outside – ouch, 57.1 degC. Being a mechanical engineer with an interest in the weather I moved the thermometer away from the metal transportatble building and made my best endeavours to shield it from radiation but still be fully shaded and exposed to the air. 20 minutes later 56.9 degC. At Lekhwair, about 80 km away on one of my trips we had 28 days straight in which the daily maximum temp on that same thermometer was greater than 52 degC every single day. One night when I was working the temperature did not drop below 40 degC. 61 degC had been recorded at Lekhwair many years ago. At a place 200 km south on the Saudi border it was just as hot as Yibal. OK, the these temps were not recorded under scientifically controlled conditions with calibrated gauges but believe me heat like that does exist our planet and it hangs around for months. I’ve never felt heat like on the border region between Oman and Saudi. The Sahara in southern Algeria was quite moderate by comparison. How did they miss Asia’s record high temperature anniversary on June 21? It was set in 1942 at Tirat Tsvi, Israel, in the Dead Sea depression. That was the last of the continental highs (discounting Antarctica). Seventy years of “global warming” and they can’t set a new record — these guys need steroids! I take issue with the rational that this site is prone to setting a high temperature record. It would be easy to check with some data from both Badwater and Furnace Creek. Where can the hourly data from the Badwater sensor be found? Two reasons: One, the steep elevation the the east will create a significant updraft in the afternoon pulling a breeze across the sensor from the west. Two, it looks like the spring is just to the west of the sensor creating a swamp cooler effect and making the air just a bit more humid (less dense) thus increasing the updraft effect in reason one. I think a quick look at the data for say 3pm local and Temp > 100F you will see a significant breeze from the west. Also the sensor looks very close to the road in google street view: http://goo.gl/maps/YEYCH The streetview picture was taken about 10-11 am judging from the shadows of the vehicles and the wind direction sensor shows a NWN direction (though it could be still). Likely spins up the wind speed every time a motor home zips by. Lastly, while I don’t think this is a good site to record a record high I can see the folks who placed it there thinking it would get the all time record high. I hope they don’t discover Surfacestations.org or they will be disqualifying records for the next hundred years. a couple of years ago. The compressor booster for our drillrig shut down because of overheating. It was rated to 50 C. On the same day the nearby pastoral station recorded 55C [unofficial recording]. So there are plenty of warm places on the planet. The Afar Rift for instance. And for interest Marble Bar recorded 160 consectutive days of maximum temperatures of and above 100F in 1923-24. By invalidating that record, they can now point to one that is obviously the result of global warming. The 90-year old one was a bother, don’t you know? As I recall, there is what I believe you ‘merkins call blacktop running between the cliffs & the pool which will warm the site too. As for the Min temp., this is also from memory, isn’t Furnace Creek a dried up bed which rarely, if ever has water, whilst Badwater is one of the few places in the valley where there is always water? That’s got to help a little on the Min. This was the actual reason I suspected at the time, to raise the mean. I am offended that the moderators (who black-flag me for far less offensive wordings) allowed me to be referred-to as a “merkin”. I got a lot more sensors they need to check right now! Larry, you can call me a Limey if you like. The mod was correct & it’s a jokey contraction. Crikes! I looked it up too! That never entered my head. The AGW crowd is constantly pointing to “extreme” weather in recent years as evidence that climate change is happening. They’re pretty ugly charts with tens of thousands of data points, but they provide an easy visual appraisal of individual “extreme” min and max over more than a hundred years, plus an average trend line. These are “raw” BoM temps but that doesn’t mean pre-1910 haven’t been adjusted. There are debatable Glaisher/Stevenson recording differences before 1910 (see http://www.john-daly.com/screens.htm) but even post 1910 almost all locations show a decrease in extreme hot days and a decrease in extreme cold nights. 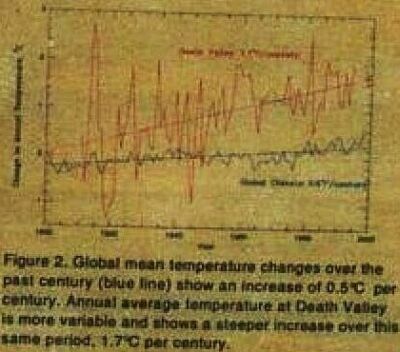 Archived newspaper clippings of Fahrenheit temps suggest that most pre 1910 BoM adjustments to compile their raw records were down due to the estimated Glaisher anomaly. The locations mostly still operating and showing a clear increase in averages over the past 30 years, particularly min, are the capital cities. My opinion of the charts is that, putting UHI aside in the five capitals, the main Australian climate change in the 20th century was a decrease in extreme hot days and a decrease in extreme cold nights. Is AGW an acronym for Anti Great Weather? The charts suggest an overall increase in nighttime minima, whether city or country, but UHI remains a suspect because the rural post office stations were still affected by surrounding populations increasing from a few thousand to tens of thousands over the decades. i think that if the World Record Temperature Record is suddenly withdrawn from Libya. there could be a severe backlash with the excessive burning of many American Flags in an attempt to raise temperatures and regain the World Record as a matter of National Pride. Furnace Creek is a nice place in the spring (daily highs around 100F). There is a nice four star hotel there, that I recommend. (Especially the hot mineral pool and bar!). I believe the weather station is down at the ranch, which is right at about sea level. Badwater is at -275 feet below sea level. (No nice hotel there!). Quick calculation indicates that the elevation difference amounts to about a one percent increase in atmospheric pressure (~7.5mmHg). How much air temperature difference does this amount to? If you ever go to Badwater, it is worth it to take the lengthy drive to the adjacent mountaintop to the southeast to a place called Dante’s View (at something like 8000 feet). Quite a view! Especially if there is still snow on top of the Panamint Mtns. (11,000 ft) to the west. There are not many places where you can eyeball that much vertical relief. Now that summer’s over, Death Valley season is just beginning! Personally, I hope they *do* discover it. Might bring some sanity back to the discussion. Come to think of it, it might bring some discussion period, for so many who ignore having one. As for the joke at the beginning: my vote is to leave it, if I have one. Though I suspect Anthony has developed a bit of a thick skin at this point. I do think it’s relevant, given a certain crowd (and realize that some of the same people who support CAGW (Occupiers) has been over in Africa helping the same people involved in the ‘protests’) have the same whiny faux tendencies to be ‘offended’ as the ROPO crowd (religion of perpetually offended. Not entirely OT, the ‘source’ of the attacks seen this week was not some juvenilely made youtube film. These attacks were planned months ago, scheduled for the 9/11 anneversary, seeking the release of the ‘Blind Sheik’, also known as the mastermind of the first Twin Towers Bombing in 1993. About 0.8 degrees centigrade (1.4 degrees Fahrenheit) if one assumes that the dry adiabatic lapse rate applies (which is highly likely in Death Valley). Seems only fair that someone start an international inquiry into the recording circumstances of the “Record” Death Valley temperature before award it any status….or was American record keeping in 1913 beyond any possible criticism? There’s a future climate progress post peeking out of that. Was in DV a few years ago on a 4 week west-coast road trip and definitely felt that Badwater was hotter then anywhere else in the valley – the in-car thermometoer (probably not appropiately calibrated by the WMO) registered 50C at Badwater and 48C just about everywhere else. Putting the roof down on the convertible lasted 2 minutes before those in the back compared the experience of that heat coupled with the wind from car motion as being akin to sitting in a fan oven. So, (forget that tourist sign placed at Badwater by the park service. They were not trying for computer age accuracy) as I make it, there is an -85 foot difference in altitude, (-40 meters). This may not sound like much, but it does make a temperature difference. Personally, I think it makes a big difference. I’ve hunted for agates, opal and chalcedony in the ravines just outside of the park boundaries (Tecopa area). Stay in the wrong ravine too long and it is easy to reach the sunstroke stage of heat exhaustion. During the peak of the day, you just can’t drink water fast enough to keep your body properly hydrated if you are active. So stay inactive when it’s hottest. So this additional temperature station is an apparent attempt to spike the current highest remperature reading at Death Valley… (definitely a pregnant pause moment). Makes one wonder why they chose an evaporative site. Yeah the reflection is intense, which is kinda why I avoid large salt fields out west; I hate getting sunburnt on the underside of things (nose, eyesockets, ears, chin…). Plus, I’m not a halite collector (salts mostly sodium chloride with impurities). If NOAA really wanted a temperature spike they would have chosen a deep cut ravine with dark earth and full afternoon exposure. (We’re on to you NOAA, so no bright ideas). I wonder why a second temperature collection site has been installed in Death Valley. If NOAA want two temperature stations in a park, there are many more popular places than DV. Even with seasonal tourist throughput it is a downright lonely place with minimal population per sq. mile. Especially during the time of year one expects the highest temperature readings. I wonder if they’re trying for highest day reading during the other three seasons instead? Or perhaps they want to use Death Valley Badwater temps to adjust some other places using their duplicitous smoothing and fill algorithms? If one wonders why my slightly snarky evaporative location comment; anywhere in our American west, one can definitely feel a temperature drop near water sources. I’m not sure about Badwater as it is a large open space with large volumes of air circulating over saturated salt solutions, but evaporation effects are generally cooling. Maybe even enough to offset that drop in site elevation. Um, can I raise a few objections? Secondly, no-one seems to know the _name_ of the fort – much less has any photographs of it. Does humidity at all impact temperature measurements? Up or down? Are there any studies? Does humidity affect temperature measurements in any way? as cities not only produce heat traps in the form of tar roads and concrete, but also humidity. Look at Las vegas for instance, with its watering of expanding golf courses, lawns and parks. Could be an overlooked factor. So. If you are in the “in” crowd, you can publish outrageous nonsense and insults, but if you are not one of the “ins”, you can not publish and answer to the outrage. Looks like the old record set in Libya might be more accurate than any new record set in Badwater…. Ohhh the irony, siting issues dont matter except when it suits, they harrangue folks on here for years for questioning the data sources due to siting, and possible obs bias, not to mention equipment changes etc etc etc. Yet when they want to, they use the very same logic and rationale that Anthony and the team use and now its valid. The joke about rioting in Libya is unfunny not because it will provoke more rioting but because terrorists used the rioting in Libya to kill Americans there. It dishonors those killed and is disrespectful to their families. I’m as guilty as anybody when it comes to showing poor judgement from time to time, but I fail to see the humor. Did you see the pictures of our ambassador being dragged through the streets? Last I heard, he was being “dragged” to a hospital. He was being carried, not dragged (there is a difference). Take your outrage to another blog, there are many that will agree with you. (Or stick around for more abuse, that will be snipped anyway). Guess you had to be there ? Fascinating how we have those PC Police everywhere making ludicrous, unwanted and irrelevant accusations and comments. Limiting free speech at any given opportunity. Manners do not allow me to respond in an appropriate fashion but you can take your comment to where the heat theoretically burns the most.